Every detail of the Absolute 50 Flybridge Yacht has been engineered specifically with your enjoyment in mind. It's models like the Absolute 50 Flybridge that have been responsible for Absolute's rise in popularity in recent years. The 50 Fly won the European Boat of the Year Award as well as the Best Flybridge Yacht Up To 55' at the Asia Boating Awards. The Absolute Navetta 48 also recently won the 2019 Boat of the Year Award at the Slovenian Awards and has sold the all of the available hulls to come off of the production line. These accolades only reaffirm the positive reception that Absolute's commitment to the quality of their yachts has made on the boating community. The Absolute 50 Fly encompasses all of the wonderful attributes of its larger siblings, much like the 62 Flybridge. The use of space and light in the salon and lower deck staterooms removes any feeling of being "in the basement of the boat" where yacht owners can often feel closed in. The sporty performance and maneuverability are a testament to the Volvo IPS-600 systems that power her and offer efficient fuel consumption. Combine those factors with several intelligently laid out "social zones" and a truly competitive price in the market, and it's easy to see why the Absolute 50 Flybridge has become one of the most sought after boats in its class. The "fun zones" on the 50 Fly are at each end of the yacht and up on the flybridge. The hydraulic swim platform lowers down into the water providing a great place to cool off or a launching point for diving and snorkeling. That's not all the fun features on the transom. There is also an optional summer kitchen that includes an electric grill, sink, storage, and counter space for the ultimate cooking spot! While the aft cockpit does have a sunpad for laying out near the swim platform and the convenience of the galley nearby, the bow seating area also features an impressive platform. Bench seating provides a great place to sit and enjoy the breeze while at cruise, but the real star of the bow area is the triple sunpad. These sunpads come with adjustable backs that allow you to lay at an angle or convert them to forward-facing lounges. The flybridge is well designed and spacious, particularly for a boat of this space. It maximizes every possible opportunity for a sunpad and more seating. The sunpad forward on the bridge has the same adjustable options as the sunpad on the bow. For an exhilarating experience, lay on the flybridge sunpad looking forward while the boat is at a 25 knot cruise. Aft on the flybridge is a J-shaped couch with a solid wood, pedastal table. Overhead lights on the hardtop illuminate the bridge in the evening for amazing ambiance. The main deck interior of the Absolute 50 Fly is designed with "space and light" in mind, a common theme in all Absolute's. Upon entering the aft cockpit doors, the galley is portside and angled to maximize space. It features an induction cooktop, microwave, stainless steel faucets, fridge/freezer, and Corian countertops. Having the galley aft makes it easy as well to serve drinks and meals to the cockpit table. After a step up from the galley, the salon features both a large couch on both sides with the starboard side having a dining table and room for 5-6 people. Being in close proximity to the helm is nice for the captain who doesn't feel separated from the conversation when driving. Large windows line both sides of the salon and galley providing an abundance of natural light. Behind the starboard sofa, an electrically controlled television can be lifted to view or hidden behind the couch. The lower deck accommodations on the Absolute 50 Fly feature a 3-stateroom, 2-head layout that can comfortably sleep six people on board. The master cabin stretches the full beam of the yacht and is placed midship. It features a king-sized berth with night stands and storage spaces surrounding the bed. There are three hull-side windows both port and starboard for excellent natural lighting. There is even a full-sized master closet. The VIP guest room is placed forward in the bow and features the same hull-side windows. There is a queen-sized berth and an abundance of storage space. The third stateroom shares a head with the VIP and has side-by-side twin bunks. SI Yachts is proud to represent Absolute Yachts in the Northeast and continually stocks new models. For a complete list of Absolute inventory available now or currently in production, please give us a call at (718) 984-7676 or by email at Sales@SIYachts.com. 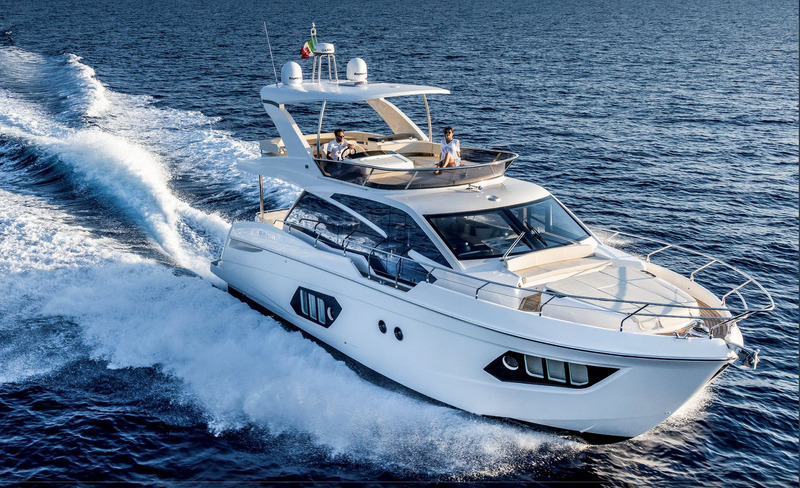 The Absolute 62 Flybridge Is Where Italian Style Meets American Functionality: This post goes into detail describing all of the features on Absolute's newest model, the 62 Fly. Beautiful lines, amazing features, and sporty horsepower make the Absolute 62 a yacht you won't want to miss. Absolute Yachts Debuts The New Navetta 48: Long-range cruisers rejoice! The Absolute 48 Navetta could be described as a trawler if it weren't for its speed and Italian style. If you love to cruise, read up on the new Absolute 48 Navetta.